ICT Essentials is designed to provide maximum flexibility to schools in how they implement the individual courses. Since licensing grants teachers with full access to the curriculum guides for all ICT Essentials courses, they are permitted to implement them in whatever manner makes sense for the school. Below are descriptions of how ICT Essentials might be integrated with other course material. The individual courses within ICT Essentials may, with the availability of the technology, be integrated with any existing unit of instruction regardless of subject. When done this way, teachers adjust the context or theme of the activities to suite the subject material they are teaching. In this way, students learn the teacher’s content by using the technology of the ICT course. For example, in one lesson, a Social Studies teacher might have small teams of students research and create a slide presentation on one or more aspects of the creation of the transcontinental railroad. To complete their project, students would use content in the Communications, Word Processing, and Multimedia Essentials courses. As with standalone implementation scenarios, teachers have the flexibility to repeat lesson activities multiple times, adjusting the theme or context with each repetition to suit the topic of instruction. As in the above example, during the following week, students might use the same combination of technology skills to complete a new project related to the migration of population across the United States. In each of these cases, the context changes according to the teacher’s creativity or subject material even though the technology is the same. In single subject integration scenarios, the teacher would not necessarily be responsible for teaching all of the associated technologies. Continuing with the above example, the Social Studies teacher may rely upon the English teacher to integrate Word Processing in their course, and the Art or Science teacher to integrate the Multimedia Essentials content into their courses. ICT Essentials courses may be integrated into courses across an entire curriculum and can be highly effective in students becoming more technologically proficient. Such an integration strategy does require more upfront planning and collaboration among teachers, especially when integrating across multiple subject areas. The flexibility of ICT Essentials being integrated across multiple subject area helps to reduce the teaching burden on any single teacher. This can be especially important when one considers that some of the more advanced technologies are dependent upon subordinate skills obtained in other ICT Essentials courses. As shown below, ICT Word Processing Essentials may be taught by quite a few teachers to whom a student may be exposed to during the course of a regular day. The teachers of these courses could collaborate in determining which technology skills each will teach or emphasize. The ability for teachers to plan ahead as to the technology skill set that students bring into their class cannot be undervalued. Consider the Biology teacher who knows that her students have fundamental spreadsheet skills acquired in their Math class before coming to her class. She can confidently plan on administering lab activities involving data collection and analysis without reservation…and perhaps expose her students to more advanced spreadsheet capabilities. Though advance planning and collaboration is necessary to maximize the effectiveness of ICT Essentials for the greatest number of students, exposing students to solving problems (aka projects) using various technologies in various contexts strengthens their mastery of the technology and deepens their learning of the subject matter. Below are descriptions for how single or multi-course implementations might appear in a school when the courses are not integrated with other course material. 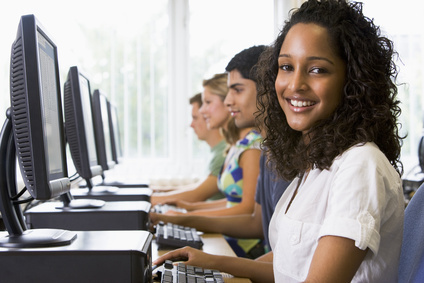 The individual courses within ICT Essentials may be taught as standalone units of instruction. When done this way, teachers can adjust the length of time needed for implementation by repeating the lesson activities multiple times, adjusting the theme or context with each repetition. This approach to implementation may be a good match for a middle school “wheel” course, typically three to nine weeks in length. ICT Essentials courses may be combined together into a single course of instruction with a specific theme, such as “Business Applications.” A combination of this theme might include the Communications, Word Processing, Spreadsheet, and Multimedia Essentials courses. Another combination might be entirely media focused, with Multimedia, Web Design, and Gaming Essentials making up the course. In some cases, a combination of courses might make sense in a supporting or preparatory role to existing curriculum. For instance, the Computing, Programming & Logic, and Cyber Security Essentials courses might be combined to prepare students for a follow-on course in STEM robotics technology. As with the single course standalone implementation, teachers can adjust the scope and complexity of the instruction to adjust the length of time needed to conduct the course. Combining courses in this manner can be suitable for offering them in semester or even year-long formats. One of the key design elements of ICT Essentials is the inclusion of progressive formative exams and a summative exam as described below. While formative exams provide teachers with a mechanism for gaging student progress, the summative exam provides a mechanism for documenting student mastery of the technology in the course. Each course includes formative (or interim) tests at beginning and intermediate levels to enable teachers to assess student progress and learning gains, and to adjust their teaching accordingly. This strategy enables differentiated instruction and Response-to-Intervention (RTI) strategies to be initiated when most appropriate. Formative tests are proctored by the teacher and provide assessment of student readiness for the summative exam (which is proctored by a different person). Teachers can use performance reports from the formative tests to identify students who might benefit from additional instruction in specific content areas. Students can take the formative tests any number of times, at the teacher's discretion. Formative exams are in addition to the short quizzes contained within each lesson. Each course includes a summative exam that assesses students' mastery of the course content. A passing score on the summative exam qualifies the student for the ICT Digital Tool Certificate for that course. The summative exam also provides teachers with a basis for course grading. Each summative exam presents 30 multiple-choice questions from a larger pool, generated by the testing system with questions and answer choices in randomized sequence. Students must earn a score of 73 percent or higher to pass the summative exam and earn the ICT Digital Tool Certificate for the course. If a student fails the summative exam, s/he is allowed a maximum of two retake opportunities. Once a student has passed the summative exam, s/he cannot retake the exam to attempt a higher score. The summative exam must be proctored by someone other than the teacher.